Boris Karloff would be proud to own this classic Frankenstein Switch. 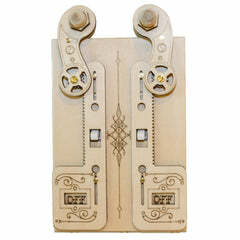 Twenty three wooden components make up this very special switch cover. Laser cut from Baltic Birch wood, with Aspen handle. 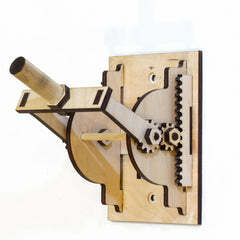 The parallel idler gears cause the floating shuttle to move in the same direction as the switch handle. Easy installation, simply attach the switch cover over a standard toggle switch and reuse the existing screws.